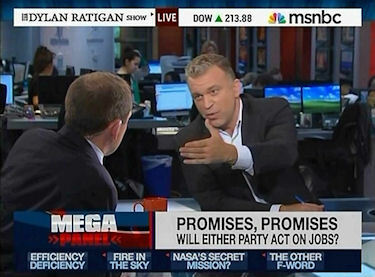 Dylan Ratigan vs Tim Carney: How Much Does Big Labor Spend on Political Campaigns? 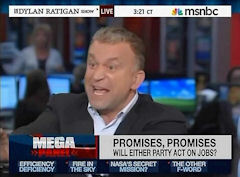 On the August 15 "Dylan Ratigan Show," MSNBC anchor Dylan Ratigan and the Washington Examiner's Tim Carney sparred over the extent to which Big Labor impacts the political process relative to other industries. Ratigan, who has made a career out of bemoaning the influence that the energy, banking, health care, defense, telecom, and agriculture sectors exert on politics, omitted organized labor from his exhaustive (exhausting?) list. After Carney pointed out that labor unions collectively direct more campaign contributions to political candidates than any other industry in the country, Ratigan sternly corrected him: "That's not right. You can't invent facts...that's a great distortion of facts to make it look like labor controls the government." According to Duquesne University professor Anthony Davies' chart, posted by Big Government last month, Big Labor has contributed to more political candidates and political parties from 1989 to 2009 than all "Top-100" special interest groups combined. The study shows that during that time, labor unions have donated twice as much money to political candidates and parties as the telecommunications, insurance, pharmaceuticals, and real estate industries combined. Honing in on more recent spending reveals that while Big Labor expenditures vary by election cycle, the top unions are always formidable forces. Open Secrets data shows that while the Chamber of Commerce, a pro-business lobby, spent the most money among non-party committees, nearly $33 million, during the 2010 cycle, the top three labor unions combined to outspend the Chamber: the Service Employees International Union (SEIU) spent almost $16 million, the American Federation of State, County and Municipal Employees (AFSCME) spent $13 million, and the National Education Association (NEA) spent $10 million, for a grand total of $39 million. Data from the 2008 cycle paints an even more promising picture for Carney's case: the SEIU spent the most money, $42 million, and the AFSCME spent the second most, nearly $20 million. Meanwhile, the Chamber of Commerce spent about $16.5 million. Overall, spending by non-party liberal groups outpaced non-party conservative groups by $159 million to $120 million, respectively. While no one doubts the influence of pro-business groups, Carney seemed to be on solid footing by insisting that Ratigan add Big Labor to his list of influence-peddling bogeymen. IMOGEN LLOYD WEBBER: Can I just ask a question here? Have politicians and people in this country gone more to the left or more to the right? Reagan, for instance, raised taxes 11 times. DYLAN RATIGAN: Can I tell you why I think that's the wrong question? Because all of our politicians – all of the Democrats in this country, all the Republicans in this country, pretty much everybody that's there – gets all of their money for all of their political campaigns from banking, health care, energy, defense, communications, and agri-business. TIM CARNEY, Washington Examiner: You left out labor. RATIGAN: That's not right. You can't invent facts. 40 percent of all political donations come from finance, insurance, and real estate. I'll show you the numbers afterwards, I don't want to get drawn into a hole. CARNEY: Of the top 10, 5 are labor. CARNEY: I'm not saying they control it, but if you're going to list the biggest givers you have to list labor. RATIGAN: Just give me one second. So is it a matter of left or right or is it a matter that all the politicians have been bought by industries that profit at the extraction of America? RATIGAN: In other words, when we indulge the question – I wonder if we're Democrat, I wonder if we're Republican, I wonder about the Yankees or I wonder about the Red Sox – the problem is they're all bought.